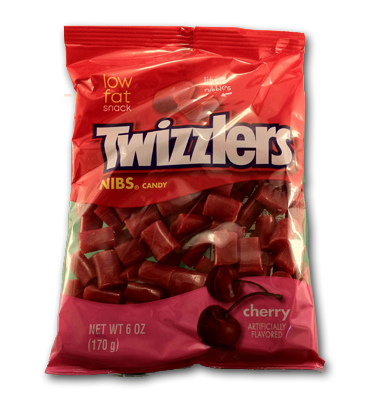 I’ve walked by bags of Twizzlers Cherry Nibs easily over a thousand times in the super market without picking them up. In fact, I still haven’t picked any up, but thankfully a friend gave me a bag. He knows we’re big licorice fans here, and he claims that these bad boys are top notch. I think I had relegated them to Grandma candy status, albeit unfairly. After laying in to this bag, it appears that I might have been a bit hasty. These nibs are pretty damn decent. But…with the good comes the bad. The good news here is the overall candy eating experience: the shape, consistency, and chew are all excellent. 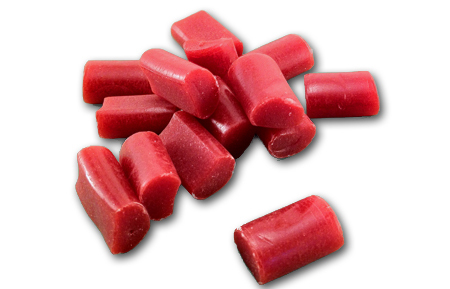 The pieces are small and chewy enough that you really don’t need to eat a ton to get that good time licorice eatin’ thing going. The toughness evokes the ball park rope licorice you get at the…ballpark. And zoos and carnivals and such. In short, for better or for worse, these bear no resemblance to what most of us think of when we think of Twizzlers- those sweaty, oily deliciously delightful ropes that are Halloween faves. But here’s the rub- the flavor of these, while pretty good, just isn’t that great for me. I like cherry candy, although admittedly it’s not my favorite. Something about this particular cherry taste is a bit weird. If these were flavored like “red licorice”, then they’d probably taste just like the aforementioned red ropes and I’d love them. I’m not saying that I don’t like change or variety–I do, I like branching out. Just not with a cherry flavor like this. To me, cherry is only good if it’s sweet and tart. But this iteration has nothing on the tart side, so I’m left with a semi bland cherry chewy world. There’s also something just a bit off about this cherry. Something perhaps in the smell of it. Not sure. If Twizzlers made these in strawberry flavor I’d be all over them. As is though…I have to say they’re pretty mediocre in large doses: so just pop a few, and you’ll probably be alright. but for a go-to treat? Not for me. Nib these almost anywhere you go, no need for purchase link. Standard strawberry Twizzlers are awesome… I don’t understand where things went wrong concerning cherry. I remember the peel and eat cherry Twizzlers and they were terrible…these follow suit. The rainbow Twizzlers are equally as terrible.